(1) Route confirmation required. Recorded as traversing the Severn & Wye Railway including Severn Bridge section and various closed to passenger lines in the Forest of Dean. 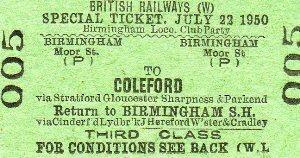 Stephenson Locomotive Society members were also invited to travel on this trip.